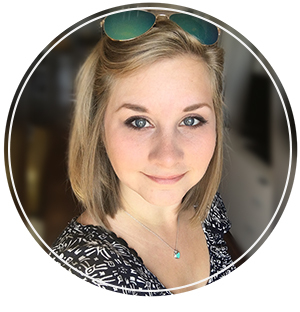 Tanya Draws Illustration and Design: Redbubble Shop Updates & new collection! 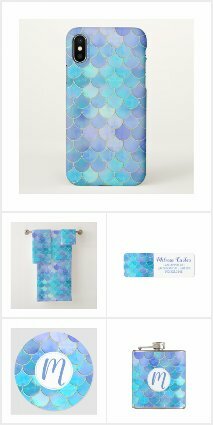 Redbubble Shop Updates & new collection! Redbubble did really well over the christmas holidays and I continue to sell things daily! My most popular product is stickers, but I also sell a lot of pillows and t-shirts there too. In total I made 18 sales on RB over December. If you would like to see what I sold in December 2015, Visit my redbubble "journal post" where I have made a list of the different things I sold. Click here to see it! Redbubble is currently my favourite POD right now. I find it a very artist friendly print on demand, not only have the staff been very helpful in any interaction I have had with them, but my work has also been featured on their social media feeds! Not only that, but the ability to set your own royalties is always a plus. 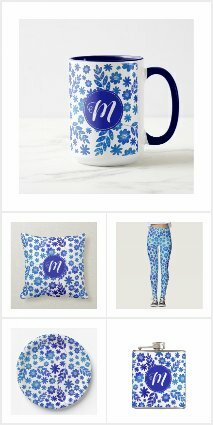 Their product customization tool is great for artists, it takes very little time to add your artwork to RedBubble, giving you more time to keep making designs. :) My only complaint about RedBubble is that it is hard to share product views with your design on social media. Say I go to share a pillow, sometimes the pillow mockup doesn't get shared, only the artwork. While its great to show people your artwork, its important to me to be able to share all the products from RB with my designs on it to my social media streams! I hope they fix this in the new year. I also purchased things from RedBubble in 2015 - a pillowcase & a laptop case, both of which were fabulously printed & a nice quality. Shipping to Canada also didn't cost me an arm and a leg, which was a plus. I keep forgetting to post a review of my laptop case, but I will do that some day! 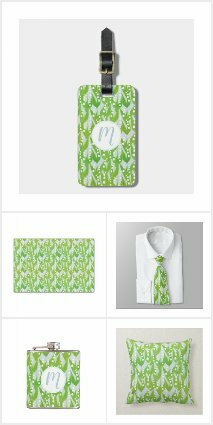 Redbubble is my most up to date print on demand right now, and the place where you will find my most current work! I have been adding Valentines day themed products lately.. my favourite is a valentines cat typography piece that I did.... Of course! 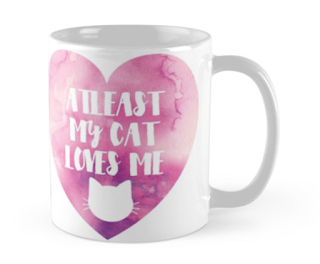 ;) It is a heart design with the text "Atleast my cat loves me" it comes in watercolour pink, and soon I will add it in a flat vector black as well! 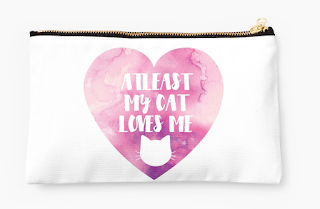 This humorous & trendy design is perfect for cat people on valentines day. I love this one in stickers & mugs... but here are the products so you can see for yourself! Enjoy! 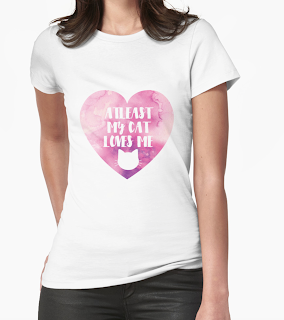 Cat love t-shirt? yes please! This will allow you to make everyone jealous on Valentines day. You have a cat that loves you! ;) Plus the watercolour heart is a perfect for valentines pink. 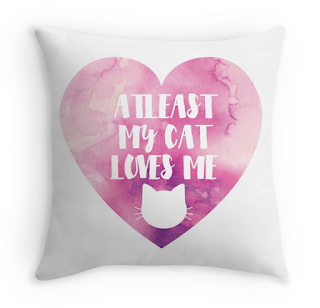 This pillow is something both you and your loving cat can enjoy. This makes a cute addition to any cat lady's room! Redbubble pillows come in three huggable sizes, plus you have the option of ordering the pillow fully stuffed, or you can just order the pillowcase and save a bit on shipping! Invited to any valentines day or anti-valentines day parties, but are a single lady/guy? Stuff this bag with whatever you need to enjoy the party and have fun! 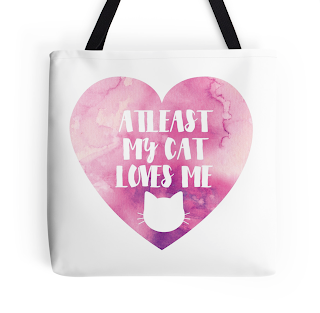 This bag is a great conversation piece if you are trying to find other cat people! These studio pouches are adorable! They are great for make up, as a pencil case for school, holding all your spare catnip mice/ toys (what? you have to be prepared in case a new cat or kitten wishes to love you) or just for holding loose things in your purse! I love them. The pink in the watercolour heart looks fantastic with the gold zipper! Hope you enjoyed this update! :) I am going to be posting about my DesignByHumans store very soon. I am also enjoying DesignByHumans a lot... I can't believe I let it sit for so long! I will update as soon as I can! New Year, New Designs, New shops!